From Arid Recovery’s initial 30 burrowing bettongs, released in the reserve in 1998, there are now between 6,000 and 8,000. Bettongs were previously vanished from SA. General Manager of Arid Recovery Dr Katherine Tuft said while the program’s success is great, there are issues with having too many of the animals. So, they are victims of their own success, of over-breeding? Due to their overpopulation, some will be relocated to other reserves. They are planning to reintroduce a native predator – the Western Quoll – in 2018, and we expect that quolls will eventually help to regulate the bettong population naturally. so the Cat will be let loose among the Pigeons! Nature’s way of population control, with natural, not introduced, predators! Bettongs are also known as rat kangaroos, that have a spring in their hop. These small marsupials are endemic to Australia and were once widespread throughout the country, but now are only usually found on islands or inside fenced reserves where they are safe from feral foxes and cats. Maybe the animal’s demise is partly because people don’t like “rats”, or even kangaroos? A bilby might get sponsors, but a “rat”? Even world-famous iconic koalas aren’t safe though! 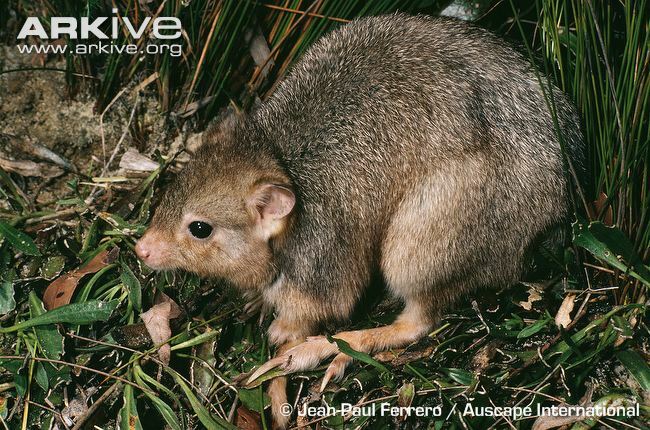 They’re in the same family as potoroos and the now extinct Desert Rat-kangaroo. 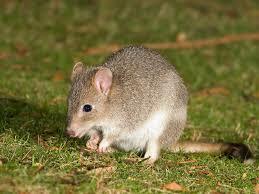 A bettong is about the size of a rabbit, with body length ranging from 30cm to 38cm among species. Arid Recovery researcher Katherine Moseby said their findings had shown for the first time that exposing threatened native animals to small numbers of predators in the wild taught them how to avoid their enemies. “We’ve got one area where we put them in with cats and we’ve got another area where they’re not in with cats. “This is an idea to try and improve their ability to co-exist with cats by just exposing them to really low levels of cats for long periods of time” . The key word must be ‘low level’ of cats, not being out-numbered! Arid Recovery manage a 123 square km wildlife reserve in the arid north of South Australia. Wildlife are protected across the Reserve using 80 kilometres of fencing that excludes feral cats, foxes and rabbits. They recognise that conservation fencing is only an interim solution to saving Australian mammals that are vulnerable to cat and fox predation. For this reason, they have dedicated the remaining 67 km² of the Reserve to developing the science that may one day allow vulnerable animals to survive alongside feral animals outside of fenced reserves. It’s a lofty aim, an ideal, that our slow-evolving, heavily-threatened species may learn strategies to survive against the odds of recently introduced predators, since European settlement? They need to adjust to a quick learning-curve and evolve quickly! Pity they can’t also learn to battle bulldozers, chain saws, axes and property-developers and other economic threats to habitats! Last year lead researcher George Wilson, a conservation biologist and wildlife manager from the Australian National University in Canberra, said that keeping vulnerable animals such as koalas, Tasmanian devils, rock wallabies, bettongs and bandicoots on private property would shelter them from cats, foxes, agriculture and other rising threats. For example, “golf courses that have suitable trees and provide protection from dogs would welcome the opportunity to breed koalas,” he said. Sounds promising if golfers were to agree to share their natural resources? AWPC policy has always been in support of interlinking wildlife/conservation corridors, however, the many pressures on land has meant this idea has not been give much priority.